1-0 Daggers. Matt Robinson with one of those goals where there’s a scramble in the box and the defender tries to make a clearance but cannons it off your bonce and into the goal. This game was far more fun when we were winning and drawing a series of games. Alas, most people managed to score points this round! 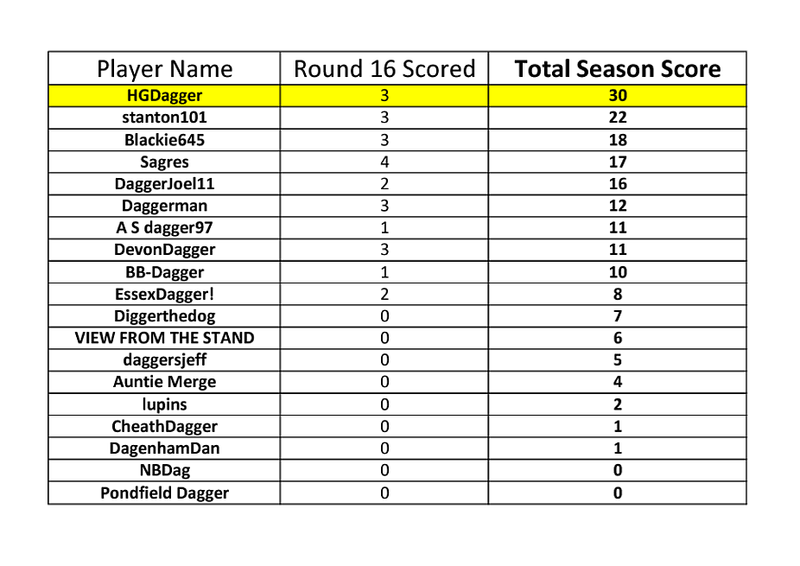 Well done to Sagres who was the only one to get the score correct. Jordan Maguire-Drew was a popular pick but actually had a quiet day at the office. Being a former Torquay player I guess it was only inevitable that Luke Young would score, fortunately I don't think the Torquay fans I know have noticed as nobody has brought it up yet!